There is a lot more to the ECOBAT group than meets the eye. Besides being Europe’s largest specialist battery distributor, it is also the world’s largest producer of lead and lead alloys, supplying battery manufacturers all over the world. As a result, more than 50 million batteries are produced containing its lead and alloys annually. This commitment has led to many of the key technology advances and product patents, but the company also works with leading battery manufacturers, adding its expertise to their own. In 2009 the group began investing in battery distribution, and today the division – ECOBAT Battery Technologies (EBT) – supplies more than 2.5 million batteries to OEM and aftermarket customers, many of which will inevitably contain its advanced lead and alloys, ensuring optimum performance and product longevity. EBT is not simply a specialist battery supplier, it is part of a manufacturing and technology group with a battery specialist division. 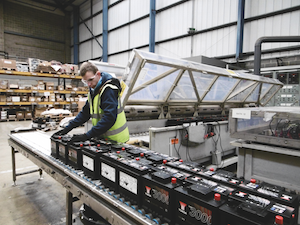 In the UK, EBT is active in virtually all battery markets, with wide sector coverage and comprehensive product ranges with leading brands such as VARTA®, Lucas and Numax. 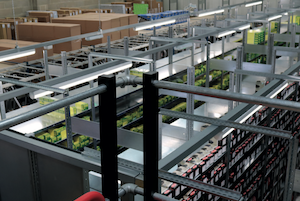 The quality of the products, combined with a nationwide distribution network, focussed customer support and high stock availability, are all contributory factors to the success of the company. 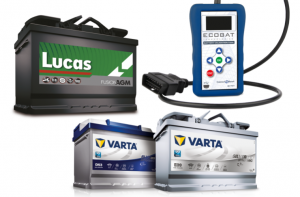 To demonstrate all things EFB/AGM and encourage technicians to look to the future and benefit from the changing world of batteries, EBT is teaming up with long-term partner VARTA for this year’s Automechanika Birmingham. As it has done previously, the company will also be using one of the event’s technical presentations – to be delivered from the Technical Training Hub in the show’s ‘Garage Quarter’ – to give technicians a glimpse of the future by addressing the realities of the growth in lithium battery technology and the responsibilities faced by workshops as the global trend for electric vehicles continues. At the same time, current technology must not be overlooked as the market transitions from traditional to hybrid vehicles, which puts greater demands on the vehicle’s battery management system and requires vehicle specific repair solutions. Technicians are at the front line, not only when it comes to diagnosing problems and making the repair, but also in educating motorists who are largely unfamiliar with this new technology. EBT will therefore be challenging them with the question: are they equipped for an electric future? Back on its stand (H81), alongside the market-leading VARTA range, EBT will be displaying the formidable Lucas portfolio, as well as its very own Numax offering, to demonstrate the depth and breadth of products in its substantial armoury. “Automechanika again provides us with the ideal occasion to connect with our customers and end-users, to help them gain a clear understanding of the challenges – and accompanying opportunities – that the latest technical developments present,” explains the company’s Sales Director, Paul Payne. There are plenty of battery charger brands out there, but how are firms standing out from the competition? Consolidation is the buzzword of our industry at the moment, but it isn’t just reserved for the factor groups, suppliers are part of this trend too. “There has been a lot of consolidation of battery brands with only a few major players left in the market.” said Gary Vincent, Sales Manager of American battery charger firm Noco. While battery brands are shrinking, he says the opposite is true of chargers, “In terms of battery chargers, there is an increasing number of battery charger brands entering the market from the far-east with little actual battery charging experience and just looking to make quick money on places like Amazon,” he said, adding that this has had a knock-on effect on product quality and safety in the marketplace. In a similar vein, Banner Batteries is raising awareness and the importance of battery chargers and maintenance to its retail network in the form of ‘visually appealing’ display units and marketing materials including a pocket guide leaflet for its Accucharger range. Lee Quinney, Country Manager at Banner, elaborated: “Developed to ensure that modern lead-acid batteries attain their anticipated long service life through regular and necessary equalisation charges, each Accucharger is more than capable of powering up any starter battery easily, fully automatically and safely. In addition to their functionality and suitability for all 6/12V lead acid batteries, they are appealing in terms of their design aesthetics and have already been widely adopted by Banner’s distributors and their customers.”, he concluded. With the UK currently enduring some fairly hostile weather conditions, for the country’s motorists, it’s the battery that takes the brunt. This fact was underlined by the RAC as it issued a stark warning this week stating that they expected to receive more than 3,000 battery related callouts on the first day back after Christmas alone. The weather is however an opportunity for HELLA customers as its supply agreement with ECOBAT Battery Technologies ensures that the HELLA battery offering meets the challenge, because alongside excellent availability, it is both comprehensive and incorporates the latest products to reflect current technology. In addition, with the market-leading Hella Gutmann Solutions (HGS) mega macs range of diagnostic tools, which possess the software required to correctly install the batteries used for start/stop enabled vehicles, HELLA has all the necessary elements to provide a full battery replacement programme. Bearing in mind that battery related issues remain the most common cause of breakdown, whatever the season, battery health should be a priority for workshops. Therefore, as a matter of course, technicians should carry out a battery check on every vehicle that enters their premises, which allows preventative maintenance to be undertaken. Alongside this practical action, technicians should be recommending that customers who use their vehicles infrequently or make only short journeys, charge the battery on a regular basis, which will substantially reduce the risk of electrical related breakdown. Due to the competitive nature of the sector, proactivity is the watchword for batteries, so it is vital for factors to make sure they are supplying the correct replacement for the vehicle, which is why an accurate application guide is a must. However, it is good practice for counter staff to check whether any extra high demand electrical equipment has been added to the vehicle, as this could affect the specification. As the number of vehicles incorporating a start/stop function will only increase, the demand for AGM/EFB batteries is projected to grow rapidly and these must be installed correctly to prevent their premature failure. Unlike the traditional SLI battery, AGM/EFB batteries require a specific fitting procedure and the use of a specialised tool to integrate them into the vehicle’s complicated electronic system. Moreover, as vehicles become evermore reliant on electronics and the demands on the battery subsequently increase, the correct diagnosis of the cause of electrical related issues is vital. This is where HGS users benefit, as all mega macs diagnostic tools have the capability to introduce an AGM/EFB battery into the battery management system (BMS) of a start/stop enabled vehicle, to correctly initialise the replacement. Without this process, the battery will fail prematurely. Further advantages come with their ability to diagnose other battery related problems, such as issues with the IBS (intelligent battery sensor), which is a vital component in the BMS and, will sometimes also need replacing. Usefully, in addition to its aftermarket range, HELLA is an original equipment (OE) IBS supplier, so has particular expertise with this increasingly used product. In short, as a respected supplier of premium quality components and diagnostic equipment, HELLA’s battery programme naturally reflects the requirements of the market and provides the solution technicians need to undertake every battery related challenge. 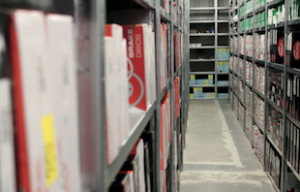 As the season of flat batteries creeps in, how are suppliers preparing garages this winter? CAT Reporter Daniel Moore finds out. Like all of the aftermarket, we wait in joyful expectation of a foggy and icy winter, but how are battery companies preparing for the oncoming season? The idea is of course to recommend a replacement before it fails to start the car, thus eliminating some of the seasonal peaks and troughs in battery sales. Of course most consumers will prefer the garage to check the state of health of their battery and Bosch Car Service member garage Spiros Motors, is one workshop that has followed suit by carrying out free of charge battery checks on every vehicle it sees. Dinos Christoforou, Master Technician at Spiros Motors, expands: “Every single service for any vehicle coming in, it’s one of the main checks that we do”, highlighting the tools used for the job, he said, “We use Bosch Bat121 Electronic Tester that measures the amperage of the battery. notifies us of how much amperage is in the battery before it needs to be charged up”, adding that a ticket print out is then issued from the machine. You might ask what the point of a printout is if the machine has it on the display, well, this information is then relayed back to the customer, complete with the printout as proof that the check has been carried out as described and notifying them of the steps taken before receiving the keys back to their vehicle. To avoid breakdowns, Steve Hudson, Head of Business Development at Behr Hella Services, says garages should consistently advise customers to maintain their battery all year around no matter how much or little the vehicle is used. “Battery related issues remain the most common cause of breakdown, whatever the season, battery health should be a priority”, notes Hudson. “Technicians should be recommending that customers that use their vehicles infrequently or make only short journeys, should charge the battery on a regular basis, which will substantially reduce the risk of electrical related breakdown”. Lee Quinney, Country Manager for Banner Batteries GB, echoes Hudson’s sentiment suggesting ongoing training should be a number one priority of any garage, particularly with the eclectic range battery technologies flooding the market. 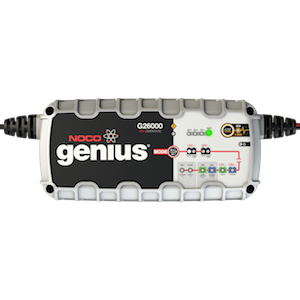 “Giving the garages the training and support that is needed has never been more important, particularly as specifying the wrong start-stop battery for a vehicle can have serious consequences”, he replied. When the time for battery replacement comes, a number of manufacturers have introduced online applications allowing workshops, suppliers and the like to source their models easily. Ecobat Technologies (formerly Manbat) is a prime example with its EBT Battery Finder that has helped extend its distribution network to many independents nationwide. “Users simply need to enter the registration number of the vehicle in the search box and the site will use a sophisticated VRM database to locate the correct car and provide access to its vehicle- specific details”, notes Paul Payne, Sales Director at Ecobat Technologies. “This information naturally includes the exact specification of the battery for which it is designed, and therefore provides an absolute assurance the battery is the precise replacement the VM has specified for that model”. With the extensive amount of gadgets and promotions on offer, workshops and retailers can be rest assured that by investing in some of these wares and services will enable them to avoid those battery blues this winter while picking up some extra revenue along the way. Whatever the weather, it looks like there is still good business in battery services for a while yet. Transfer season sees clubs scouting for talent and players looking for a comfy life, aftermarket brands have also been swapping sides over the last month. First of all, The Parts Alliance has announced a five-year partnership with the AA. The products will cover batteries, vehicle parts and consumables in a supply contract for five years. “We are delighted to be a business partner and supplier to the AA, one of Britain’s most trusted brands”. said Peter Sephton, Chief Executive of The Parts Alliance. 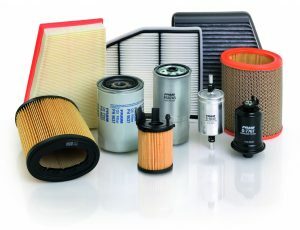 Meanwhile, Sogefi Filtration has signed an agreement with distribution giant Euro Car Parts, which will see the latter stock products under the Fram brand from the beginning of July. This will include the full range of light vehicle filters sold through ECP’s outlets in UK and Ireland. Nigel Duffield, Sales Director at Sogefi said: “The cooperation with Euro Car Parts is very promising and will surely contribute to further develop the presence of the brand throughout the country”. The CAAR buying group has also made some signings, with oil brand Mannol now being stocked by the group’s members. The lubricant producer has had a good month, because in addition to the supply deal it also won two awards from separate German car magazines for it’s Combi Energy 5w30 Long Life oil. Andrej Gaikov from Mannol said: “We are absolutely delighted to have been chosen by CAAR’s members to be stocked in their stores. I feel this is the start of a great partnership for both of us”. The A1 buying group has introduced Warwickshire-based Compressortech into its approved suppliers list. The remanufacturer of A/C compressors can now be distribute its products across the chain’s members. Gary Stephenson, Business Development Manager for Compressortech said: “A1 is a significant and recognised buying group and our thermal cooling products will further complement their expanding product ranges. 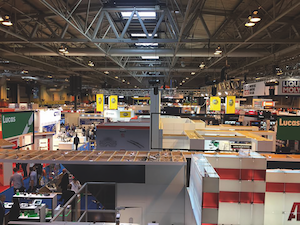 For us at the magazine, it is funny to think that 2017 was only the second time Automechanika has taken place at the NEC, such is the amount that we have written and speculated about it. Nonetheless, this is only the second time the show has happened here, and it seems much of the aftermarket holds an opinion about it. For me, the proceedings started the day before the event as SMMT had invited a handful of journalists to dinner at a nearby country pile to talk about the show, the aftermarket and the motor industry in general. One interesting stat that Chief Exec Mike Hawes raised was that the British public now spend more online on car accessories than they do on cosmetics. I haven’t been able to verify this yet, and I suspect it includes replacement tyres and servicing booked online, but even so it goes to show that the new generation of motorists are less willing to do things the old way. A point to ponder perhaps. After the show was opened, complete with ribbon cutting and the traditional comedy big scissors (I wonder where they come from?) the show got underway and we grab show organiser Simon Albert for a few words. As the show had only just opened, he didn’t have much to tell us that we didn’t already know, such as the longer opening hours, increase in aisle space etc. However, he did confirm his hit list of companies that he’d like to see attending in the future and, of most significance to us, confirmed that the show would return next year. This surprised me a little, as I’d assumed that the show would become biennial in the years that the Frankfurt show was not held. However, I was keen to get going as my appointment book was full and I was running late before I had even started. The first visit took me across Hall 19 and into Hall 20 where I could have a quick look at some of the stands as I scurried past. Liqui Moly and Auto Repar had particularly amazing looking stands. 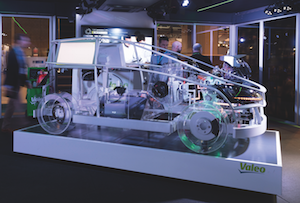 Schaeffler had used a space right next to the main entrance to build a gleaming white stage where cutaway versions of various products had been mounted on plinths for the reps to demonstrate. Valeo meanwhile, had approached the concept of having a stand in a different way, as it had simply brought a huge truck and trailer kitted out with demonstration models of various things into the hall. I won’t trouble you with the details of every meeting I had or what everyone said, except that on the first day a number of stands reported that footfall seemed a little low, which could be down to appalling weather that day as well as a crash blocking one of the motorways near the NEC that may have put some off attending. I should add that if the attendance was low on the first day, I didn’t notice it. From my point of view, Hall 19, where I spent the bulk of the time, seemed annoyingly busy with meandering people with a tendency to stop in front of me filling the aisles. It was pleasing to see that many exhibitors had brought in things other than their products to keep people amused. Sales-i brought an Out Run arcade machine for example (a game that I spent too much time on in my youth). Denso brought a VR racing car simulator, which I quite fancied trying out, but decided not to as the racing driver Rebecca Jackson was looking on, and I had no wish to humiliate myself. Other stands brought various cars and bikes from series that they sponsor as well as the usual show novelties. Holding an event after the show is always a risk, because while there will be a ready supply of people in the industry who are in the same place, there is no telling that they will be in the mood to go somewhere else after spending a day at the show. Even if they do, there is every chance that someone else has invited them first. With this in mind, I was curious to see how many people went to an event held by Motaquip at Warwick Castle on the first night. The answer as it turned out was a lot of people as the event was full. It was one of the more fun events that we’ve been to, with two apparently empty suits of armour jumping off the wall and alarming diners by staging a battle between the tables. Back at the show the following day I would have liked to have had more time to attend some of the industry and technical seminars that were taking place on a number of stages across the halls. Big names from the world of diagnostics including Frank Massey and James Dillon had been brought in as a lure to get technicians to the show (which by all accounts worked) while the heads of the garage associations talked about the various threats and opportunities du jour in the aftermarket. I did manage to get over to hear the winner of the Garage of the Year announced, which turned out to be Motorserv UK, which readers who have been paying close attention might recall we visited this time last year. One notable absence from the show was TMD Friction (who are on record saying that they have ‘no plans’ to exhibit). However, the company did rent a plaza suite just outside of the main halls to hold a Pagid Live event in association with Euro Car Parts where a number of garage owners and technicians (the majority of whom had been brought down for the event) who, after a day at the show spend a couple of hours enjoying presentations on the benefits of the Pagid Expert programme and on ECPs garage scheme (see Hot Story). If your reason for visiting the show was to find new products, you wouldn’t have been disappointed. Delphi brought a new bit of diagnostic kit for high- pressure injectors, European Exhaust and Catalyst introduced a 6-in-1 fuel system cleaner at the show and in a similar vein, Forté launched a 4-in-1 cleaning machine. Essentra Components launched something called a ‘High Tech Fluid Absorption Plug’ and I’m sure there were many other things never before seen at the event. Throughout the show, I spent most of my time in the three aftermarket halls, but on the final day I had a meeting with Stericycle (a company that manages recalls for the VMs) and so I spent a while exploring the area dedicated to the automotive supply chain. It was markedly quieter than the aftermarket halls, although it should be noted that while the supply chain market as a whole is huge and worth big money, the number of buyers within it is relatively small, and stands dealing with VM services were of little interest to technicians, so it might be unfair to judge its success on the amount of feet in the room alone. However, the highlight of the show for me came late in the afternoon on the final day when Helen Watkins from Bosch, who was manning the Extra stand, was accosted by a strange small man who kept offering her some of his special ‘home made’ sweets, much to the amusement of onlookers – apparently he’d been coming on the stand and doing this at various points throughout the show. However, just when Helen couldn’t stand the embarrassment anymore, the fellow took off what turned out to be a wig and false teeth to reveal himself as a well known customer of the firm. Apparently, his alter-ego ‘Billy No-Mates’ is a character that he regularly performs for some of his unsuspecting suppliers, and it was much to the amusement of the crowd that had built up. It was almost time for us to leave in order to high-tail it back to London while there was still time to vote (remember that?) One point that is inescapable is the topic of the show frequency. As a conservative guess, I reckon I spoke to 40 company bosses during the show and the overwhelming majority said that they thought the show should run once every two years, preferably during the non- Frankfurt years in order to keep costs reasonable and keep the momentum of the show. From the point of view of the whole CAT team, we could have happily stayed there for a month if we could – there were so many people to see. However, I’m always curious to know the experience of our readers. Did you go? Were you exhibiting? What were the highlights, and what would you have liked to have seen? Give me a shout at greg.whitaker@haymarket.com. Factor chain GSF Car Parts has announced the opening of a new store in Bristol. Located at the Aztec West Business Park, Bristol North joins its South and central branches within the region as part of company expansion plans. Following a similar setup to other stores, the 10,000sq ft. facility houses GSF’s fastest selling lines including braking, filtration and clutches with a strong focus on OE equipment for workshops. 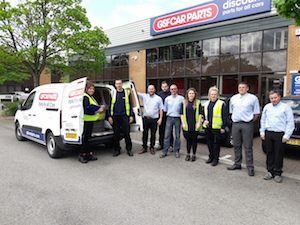 “We’ll be looking initially within a 15 mile radius for deliveries”, said Simon McMullen, Regional Director at GSF Car Parts. “Our analysis suggests this gives us well over 100 garages and associated trades to target, so there are lot of opportunities for us” adding that the factor hasn’t ruled out building more sites across the city. For more information on deliveries and opening times, garages can head over to the GSF website. GYS is a French Manufacturer of Battery Support Products. Founded in 1964, GYS employs 400 people. This 28-page catalogue includes good value consumer chargers and high-tech, multi-stage charging curve professional workshop chargers, suitable for all types of batteries including GEL and AGM. GYS also make the very popular Inverter 70 BSU, which provides 70Amps of support during extended â€˜key on, engine offâ€™ work. The range also includes starters, high quality boosters and testers. This is by far the most comprehensive Oldham Batteries catalogue ever created. The new edition includes a comprehensive application and specification section, detailing products for Automotive, Commercial and Agricultural and Plant sectors.